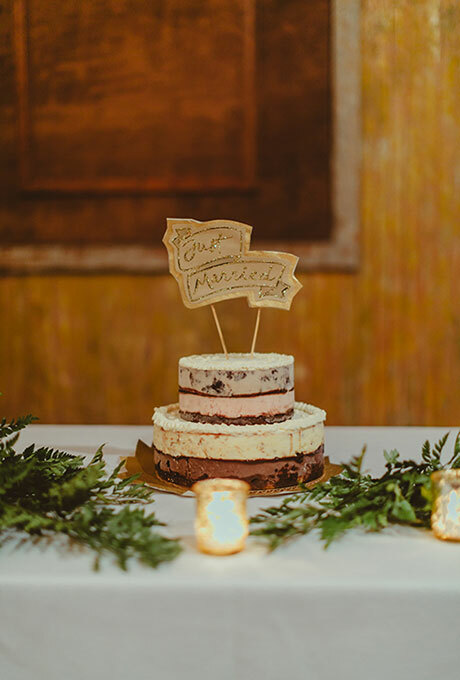 The term “modern wedding cake” may mean different things to different people. 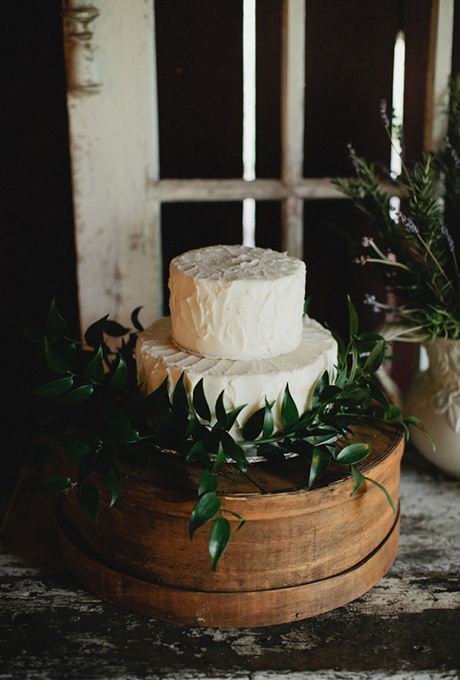 Here at A Wedding Cake Blog, we take the term to mean anything with a contemporary feel; a cake that eschews the traditional white on white, piped and buttercreamed and trimmed with swags or roses. Modern may refer to a bold use of color, or a contemporary decor or shape. It may also refer to choosing something other than the grand, traditional tiered cake – a cake of macarons, for instance, or an assortment of individual cakes. Modern means that you are updating the tradition: perhaps you aren’t entirely throwing it out. You’re just giving it a breath of fresh air. 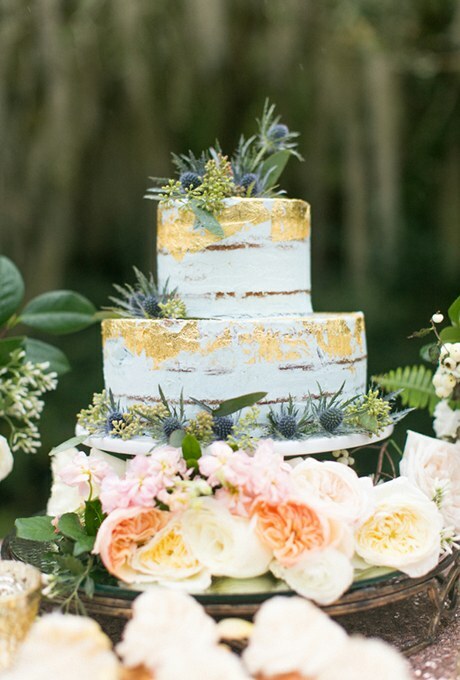 Two of my favorite colors on a wedding cake are white and gold. 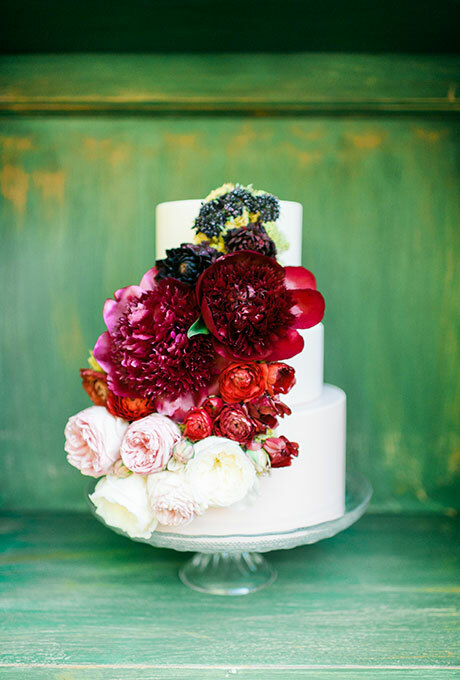 There’s just something about the color combination that is elegant and traditional. 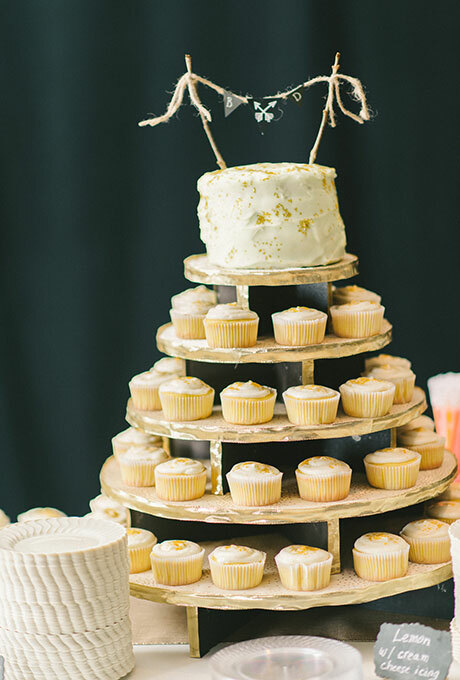 Plus you can’t go wrong using gold at the holidays. Today’s cake is rustic with a touch of elegance thanks to the addition of gold flakes on each tier. Next week is Thanksgiving, my favorite holiday. Why do I love Thanksgiving so much? 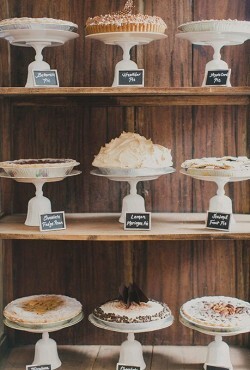 I could say “food” but in truth I love the pies for dessert. 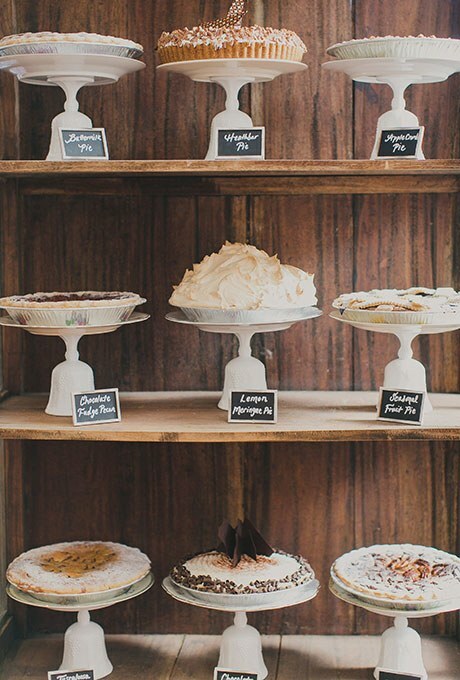 I wait all year for a slice of pecan pie and a slice of pumpkin pie – both topped with crazy amounts of whipped cream. As much as I love cake, I might love pie more. 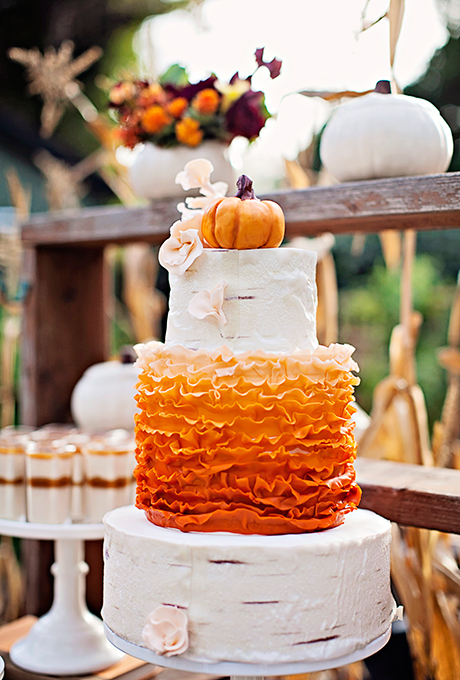 Happy Thanksgiving from A Wedding Cake Blog! 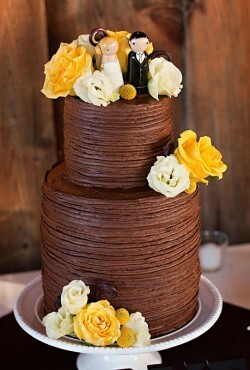 As much as I love an over-the-top wedding cake every now and then, I really like the simple and elegant wedding cake too. 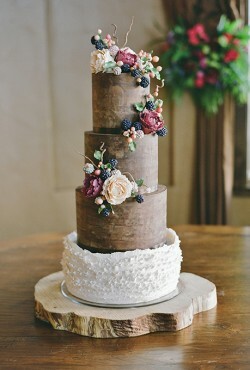 Sometimes you don’t need a lot of stuff on the cake to make it gorgeous. We raked a lot of leaves over the weekend around here. The trees are just past peak color and the leaves are raining down in our yards. Another thing raining down – acorns! 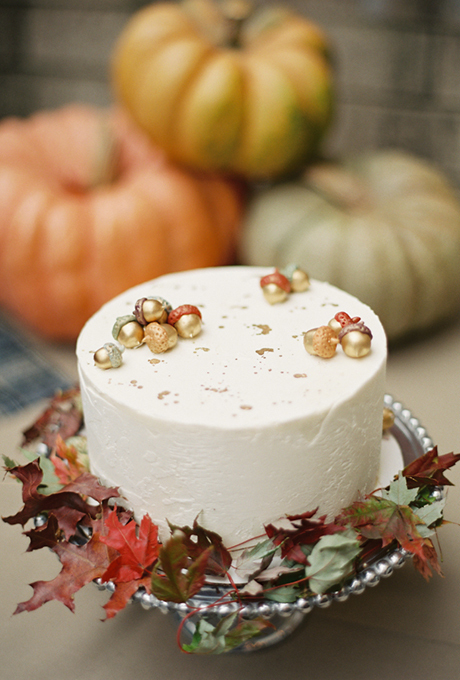 Which brings us to today’s fall-inspired wedding cake featuring colorful fall leaves and acorns.